Precise Electrical is a strong dependable team of 5 full time employees with nearly 100 years of electrical experience between them. They each demonstrate high standards and attention to detail whether their specialty is within the industrial electrical services or residential and home automation. Precise Electrical is proud of the success their team has generated and strive to continue growing through good business practice and client referrals. William takes pride in providing success in the delivery of each project while overseeing the day to day operations of Precise Electrical. He offers expert advice and clever solutions to all your electrical needs. William has been in the electrical and mechanical industry for over 25 years. He originally qualified as an electrician in South Africa in 1992. Most of his work there was installing, servicing, repairing and commissioning pump stations for district councils. William moved on to spend 10 years in London. Here he continued with his electrical studies and achieved Electrical Inspection and Testing qualifications. William managed the electrical and mechanical maintenance at various data centres, hospitals and bank trading buildings in London. He experienced first-hand exposure to urgent electrical repairs and emergency shutdowns. William initially settled in Christchurch in 2005. 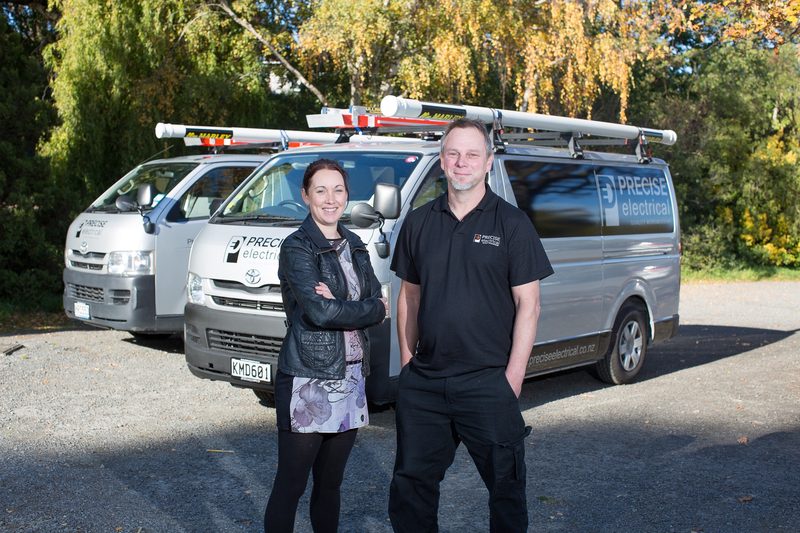 He has enjoyed the varied work Christchurch has to offer, from residential and commercial pre-wire and fit offs, to installing high-tech lighting systems in architectural designed houses, servicing and repairing various industrial plant and machinery and re-wiring of industrial warehouses and factories. 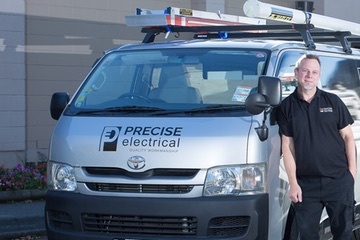 Through William’s thorough technical understanding, vast experience, extremely high standards and personable character he has been quick to grow client referrals, making Precise Electrical a successful growing business. Gina enjoys the role of growing and managing the company. She keeps up to date with the latest business trends while continually developing her skills in customer relations and business management. Gina and William work together as a great team to achieve the growing success of their company. Gina maintains a personal communication with customers to keep them up to date on the progress of their projects, while supporting the team in all their logistical needs. 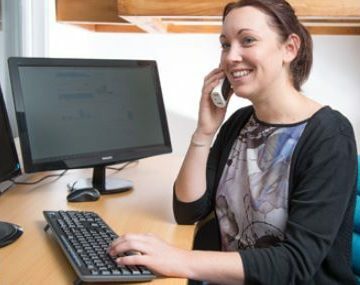 She ensures the health and safety requirements are being met, as well as taking a personal interest in their staff to make sure their individual welfare is looked after. Gina enjoys the role of growing the company’s business through her marketing expertise. She keeps up to date with the latest business trends while continually developing her skills in customer relations and business management. Gina and William work together as a great team to achieve the growing success of their company. Precise Electrical are proud members of New Zealand Trade Group (NZTG). Employ staff using legal compliant employment agreements. Being members of NZTG also means we have access to state of the art quoting software. This software allows us to create personalised electrical drawings for our clients. These drawings are then translated into quotes with a breakdown of materials and labour. It helps us give professional presentation, quick turnaround times, complete transparency and consistency with pricing. Precise Electrical have become accredited Master Electricians to give our clients further peace of mind. Master Electricians members are quality assured contractors. We are reviewed, educated and supported to enable us to maintain the highest industry standards. The Master Electricians organisation believes in us, at Precise Electrical, so much that they’ve even put money on it! We are backed by a $20,000 workmanship guarantee. Choose quality. Choose Master Electricians. Choose Precise Electrical Ltd.
We, at Precise Electrical, have joined the movement to help facilitate education, lobbying for change, be part of open source sharing of new design ideas, technologies, and building techniques. We are part of a large group of designers, builders, researchers, education providers, government, stakeholders, and leading experts in the industry to achieve collaboration toward higher building standards for all New Zealand homes.